Apple isn’t known for its web apps, though you can now access a lot of its core apps (in basic form) through iCloud on the web. 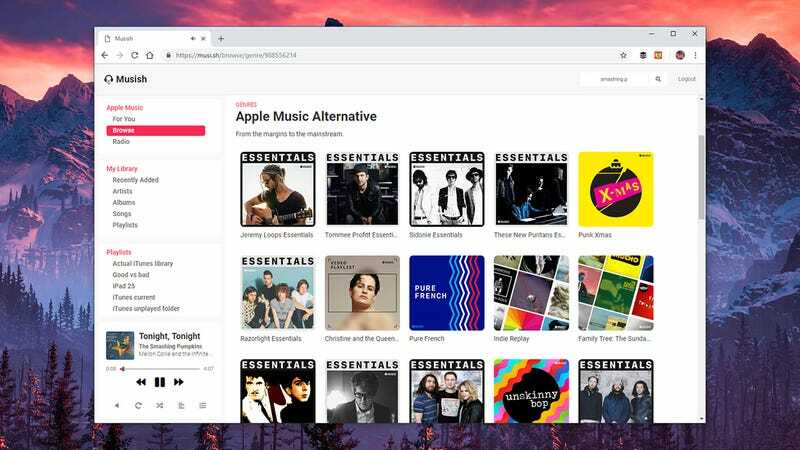 It doesn’t include Apple Music, but Apple does make APIs available for the service that other programmers can hook into—and that means there are now several third-party online players for Apple Music. Being able to access your playlists and tunes from the web (see also Spotify) has some advantages: You can keep listening on computers that aren’t your own (like your office PC or your friend’s laptop), and you can get at Apple Music from Chromebooks too. Here are the Apple Music web players we know about and what you can do with them. The newest entry into the field of Apple Music web players, Musish (which we discovered via 9to5Mac) will feel familiar if you’ve used Apple Music through iTunes or on mobile. There’s a lot of tasteful white space here, plus some handsome aesthetic touches—the mini player down in the lower left corner, the pop-up queue window, and so on. The app is open source and you can view the code here. The For You, Browse, and Radio options in the top left corner are your main ways into the player, though the Radio option isn’t functional yet due to API restrictions. The Search box is up in the top right (use it to find songs, albums, artists, and playlists). If you’re using iCloud Music Library alongside Apple Music, your local playlists get synced across as well and are found on the left. Artist pages, playlists, and search results appear full screen, but clicking on albums or singles brings up a pop-up window—click on any track to start listening or to shuffle through the entire list of songs. Volume, shuffle, and repeat are controlled via the mini player in the corner. That mini player also lets you scrub to specific places in a song, see what’s coming up next, and show the lyrics to a song (courtesy of Genius). Everything works quickly, with the responses from the Apple Music servers coming almost instantaneously. What still needs work is playlist management: Your existing playlists show up, but you can’t create new ones (as far as I can see). Adding new tracks, albums, or artists to a playlist isn’t particularly intuitive either—you can drag songs and albums from your library over to an existing playlist, but there’s no “add to playlist” option in the interface. Overall though these are minor complaints about what is a very slick and responsive Apple Music client. Use the little three-dot menu to the right of tracks to queue them up next or to replace what’s already playing, and bring up the queue pane (from the mini player) to reorder tracks or remove them. You can’t as yet change the order of tracks in the playlists themselves. As you would expect, a few features are missing—you don’t get the smart playlists or AirPlay options iTunes has, and there are no settings or customizations to speak of—but Musish is already very polished and will only get better over time, assuming of course that Apple is happy for third-party apps to carry on. Before Musish came Apple Music Player, which isn’t quite as easy on the eye as Musish but has all the same features and functionality. Its layout resembles Spotify with its long playback bar at the bottom (which I prefer, as elegant as a boxed-in mini player is). Again, the app is open source, with the code available to view here. For You and Browse are up at the top left, as with Musish, but there’s no Radio option placeholder here (again, the API doesn’t allow access yet). Search is integrated into the left-hand panel and is slightly easier to use: You can split searches between the Apple Music library and your own library (if you’re using iCloud Music Library), as well as filter through songs, albums, artists, and playlists. You don’t get pop-up windows here: Everything takes up the main browsing window, with the exception of the Up next pane (click the button on the playback bar to see it). The Up next box lets you remove tracks, but you can’t reorder them as you can in Musish. Apple Music Player doesn’t offer any way to create new playlists or add songs or albums to playlists, so you need to do all of the music curation while you’re in iTunes or in the official Apple Music apps. If you’re syncing with iCloud Music Library, then your playlists appear in a drop-down menu on the left. We’re perhaps unfairly leading with all the stuff Apple Music Player can’t do—it’s another very fast, very capable web client for Apple Music. Something it has over the Musish alternative is playback quality control: Click the cog icon in the playback bar to choose between the High (256 kbps) and Standard (64 kbps) options (handy if you’re on a metered connection). The lack of pop-up windows makes Apple Music Player somewhat easier to navigate, even if it doesn’t have quite the visual polish of Musish. There’s no harm in using them both (though Apple Music will give you a warning about multiple device playback if you have them both open in browser tabs at the same time). Despite the limitations of these web clients when compared with the mobile apps (not least a lack of support for offline playback), they’re still well worth bookmarking for any Apple Music user. They certainly load up a lot faster than iTunes does, which has to be a big point in their favor.